So I've been a bad blogger and my WIP would tell you that I've been ignoring it too. But this just gave me the kick in the pants I needed. Hope you find it inspiring too! 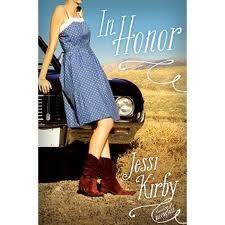 Please welcome Jessi Kirby, author of the new book In Honor. Leave a comment & you can win a copy! The Mediterranean, without a doubt. I’ve always wanted to see the white houses on the cliffs overlooking that crazy blue water. Plus I love Mediterranean food, so it’s a win all around. Hmm…I might go back to the twenties and be a flapper. I’m a planner by nature, but I do like to leave room for detours and unexpected adventures. Jessi Kirby is the author of Moonglass, published in May 2011 by Simon and Schuster. She is also a wife, mom, English teacher and former librarian, beach bum, runner, and lover of Contemporary YA, strong coffee, and dark chocolate. Jessi’s second novel, In Honor, will be released in May of 2012. Please leave a copy by Wednesday, May 9th & you could win a copy of In Honor!